Resverlogix Corp (TSX:RVX.TO) provided an update of the financial and operational results for the period of November 1, 2018 to January 31, 2019. During the quarter, the company raised additional funds in private placements, received its eighth positive DSMB recommendation, was published in the Atherosclerosis journal and after quarter end received additional funding to pursue apabetalone in pulmonary arterial hypertension (PAH). The company also participated in several scientific and investor conferences. Management anticipates that the final events in the BETonMACE trial will take place in April and topline data will be announced mid-year 2019. The successful conclusion of BETonMACE will be the main driver for future valuation. Operating expenses in 3Q:19 were $9.41 million in, a 27% decline over the prior year. The total was comprised of $7.8 million in research and development expense and $1.6 million of general and administrative expense. The 35% decline in R&D from 3Q:18’s $11.9 million was attributable to lower clinical costs as the BETonMACE trial winds down. G&A increased $0.6 million compared to last year’s $1.0 million on account of higher share based payment transaction costs. No revenues were reported. Net finance costs in the third quarter were $4.0 million. It was comprised of a ($4.1) million gain in fair value of the warrant liability offset by a $6.6 million loss in fair value of royalty preferred shares and $1.2 million in interest, fees and accretion. There were also costs relating to financing and losses from foreign exchange that netted the $4.0 million result. Net loss for the quarter was ($13.4) million or ($0.07) per share. Cash and equivalents stood at $6.5 million as of January 31, 2019 while debt and notes were carried at $14.5 million. Operating cash burn was ($8.9) million for the quarter or ($3.0) million per month in 3Q:19 compared to ($9.3) million for the third quarter of 2018 or ($3.1) million per month. Resverlogix also calculates cash burn; relative to our formula it removes changes in non-cash working capital and excludes capital expenditures yielding ($7.7) million for the quarter and ($2.6) million on a monthly basis. On the last day of the quarter, Resverlogix closed a $6.6 million private placement with Shenzhen Hepalink, which followed a previous private placement on November 2nd for $13.5 million in gross proceeds. Another capital raise for $15.1 million was completed on April 1, 2019 with Shenzhen Hepalink and other investors. Biogen (NASDAQ:BIIB) recently announced the halt of its Phase III trial for Alzheimer’s Disease based on an interim analysis that predicted the drug would not achieve its primary endpoint. 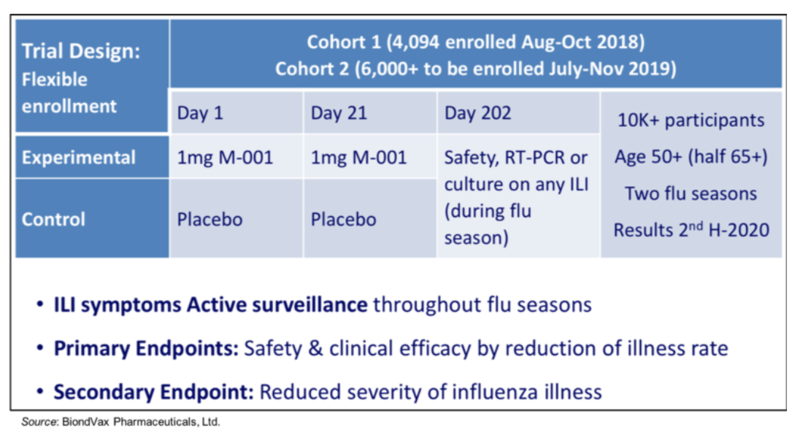 Aducanumab was the most advanced drug in this indication and many anticipated that it would provide a favorable readout and be approved in the 2020/2021 period. The failure of yet another amyloid-β focused program is likely to push interest into other directions for this indication, including in the direction of apabetalone. Resverlogix recently published a poster2 that provided details on the secondary analysis being performed within the BETonMACE study. As part of its BETonMACE trial, Resverlogix has identified a subset of patients over the age of 70 which will be analyzed for dementia and neurocognitive problems. There is a correlation between cardiovascular disease, specifically inflammation and calcification, and cognitive risk. This subset will receive a Montreal Cognitive Assessment (MoCA)3 to compare the apabetalone and placebo arms. These patients will be given a baseline MoCA exam and be measured against this every twelve months for the duration of their participation in the trial and at termination. There will also be a subgroup of patients with a MoCA score below 25 at baseline that will receive special analysis. We see the Alzheimer’s Disease space as a tremendous opportunity despite the numerous failures that have occurred. With the shutdown of the aducanumab trial, we see the industry more open to new approaches beyond amyloid-β as the industry attempts to address this difficult disorder. PAH has received increasing levels of attention in recent years as a number of new therapies have emerged. In mid-March Resverlogix announced funding provided by Canadian Institutes of Health Research (CIHR) and collaboration with the Quebec Heart and Lung Institute, Laval University to advance a study in pulmonary arterial hypertension. The $2.9 million project, which is funded by both CIHR and matched by company investment, will support a Phase II clinical trial evaluating the safety and efficacy of apabetalone in the PAH patient population. Previous studies in cellular and animal models of PAH have indicated that apabetalone may impact disease progression. PAH is a progressive narrowing of the pulmonary arteries, which can result in right heart failure and death. There are currently no disease modifying therapies available. It is classified as a rare disease and prevalence is estimated to be between 15 and 50 persons per million adults and usually occurs between ages 20 and 60. The National Organization for Rare Disorders (NORD) reported from 500 to 1,000 new cases in the US per year with a total population from 10,000 to 20,000. Based on data provided by the EMA, PAH affects approximately 64,000 people in the EU. The disorder is twice as common in females as in males. 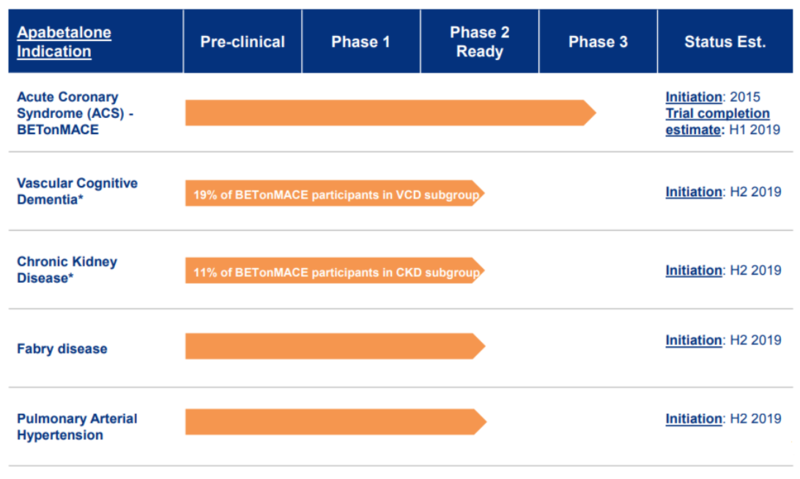 The BETonMACE trial has been fully enrolled since February 2018 and additional enrollment was allowed at Chinese sites since then to provide for additional flexibility with regulatory authorities. 2,425 patients have been enrolled and dosed in the BETonMACE trial with nine positive Data and Safety Monitoring Board (DSMB) meetings completed, all of which recommended that the trial continue as designed. The latest DSMB review was completed in March with no safety or efficacy concerns raised in any of the previous reviews. Management expects that the trial will experience its final events in April 2019 and will be able to present topline data by mid-year. The BETonMACE trial had originally intended to run until 250 major adverse cardiovascular events occurred. However, the pace has been slower than that indicated by historical event rates in this population, delaying the 250 event milestone by a few months. This may be interpreted as a favorable result for the apabetalone arm in the trial or it could be a healthier population overall contributing to the slower death rate. We will find out mid-year 2019. Resverlogix has also decided to continue dosing until 250 events have occurred, which suggests that there could be ~270 events when the trial closes, improving the statistical powering in comparison with the original protocol. During fiscal year 2018 Resverlogix has achieved numerous milestones and anticipates new ones in the coming year. Below we summarize the key events over these periods for the company. Management has guided to the final event taking place this month for the BETonMACE trial. We anticipate that it will take a few months after that to compile data, conduct analysis and present topline data. Our investment thesis on Resverlogix emphasizes the opportunity related to the size of the population impacted by cardiovascular disease (CVD) and the high degree of efficacy and evidence of safety shown so far in clinical investigations. There are additional opportunities in diabetes, chronic kidney disease and Alzheimer’s Disease. Resverlogix’s lead compound has shown promise in addressing many of the key biomarkers underlying CVD and other related diseases and potentially has applications in other therapeutic areas. We have updated our model to reflect third quarter actuals and the issuance of additional shares and warrants. We anticipate additional capital raises or access to non-dilutive capital through partnerships that will continue to fund operations until Resverlogix can submit its Phase III data to the FDA and other regulatory authorities in what we expect to be autumn 2019. We believe that a durable patent position, a competence in CVD and diabetes and a novel approach to addressing the residual risk in high need CVD patients combined with our forecasted pricing of apabetalone support Zacks’ price target. At current levels, there is substantial upside based on our forecasts and discounted cash flow model. We maintain our price target at CAD$5.00 per share. 1 Note that financial statements are prepared in US Dollars and our commentary on revenues expenses and earnings is in US Dollars, while our target price is denominated in Canadian Dollars. 2 Effects of the Selective BD2/BRD4 BET-Inhibitor Apabetalone in Cognition after Acute Coronary Syndrome In Patients 70 Years And Older With Diabetes. 3 The Montreal Cognitive Assessment (MoCA) is a widely used screening assessment for detecting cognitive impairment. It was created in 1996 by Ziad Nasreddine and was validated in the setting of mild cognitive impairment, and has subsequently been adopted in numerous other settings clinically.